Below is my “Days Out” column from The Weekend supplement in the Saturday, November 30, 2013, issue of the South Wales Evening Post. The Egypt Centre opened in 1998 and holds a major selection of Egyptian antiquities largely formed by the 19th century pharmacist and archaeologist Sir Henry Wellcome, who collected them from excavations. Admission is free. WHERE? The centre is located within the Taliesin building on the Swansea University campus. WHY? The Egypt Centre is the only museum of Egyptian antiquities in Wales. There are over 4500 items in the centre's collection. Egypt Centre staff have published over 100 online pages concerning individual items, which you can find on the Egypt Centre website at www.swan.ac.uk/egypt. The funerary items on display include amulets, shrouds, statues, coffins and fragments of coffins, and even canopic jars, which were used by the Ancient Egyptians to store and preserve the internal organs of the deceased for their journey through the afterlife. WHEN? The Egypt Centre is open Tuesday to Saturday between 10am and 4pm. Next Thursday and Friday the Egypt Centre will be getting into the Christmas spirit with the gift shop open until 6pm and food and drink on hand for visitors. HOW LONG WILL THIS TAKE? An hour is plenty of time to see all the exhibits but you can spend as much time as you like until closing time. WHO WILL ENJOY IT? There is something for all ages. WHAT ABOUT THE KIDS? Children will want to pick something up in the Egypt Centre Shop, located in the foyer of the museum. Some of the more unusual gifts available include books of Egyptian spells and curses, as well as a wide range of statues, recycled glass, papyrus from Egypt, and exclusive hand-made jewellery. Pens, pencils and key-rings are also available to buy. ANYTHING ELSE IN THE AREA? There is a lot more to see inside the Taliesin Arts Centre which provides a wide variety of performances and exhibitions. Visit www.taliesinartscentre.co.uk. Enjoy a walk through history from Celtic times to the present at St Fagans: National History Museum. St Fagans is one of Europe's leading open–air museums and Wales's most popular heritage attraction. Open to the public since 1948, the museum stands in the grounds of the magnificent St Fagans Castle and gardens, a late 16th-century manor house donated to the people of Wales by the Earl of Plymouth. Entry is free. For more information visit: www.museumwales.ac.uk. WHERE? St Fagans is situated on 100 acres of parkland near Cardiff. Located inside the site are over 40 original buildings from different historical periods, which have been re-erected over the last 50-years. Among these historical gems are old fashioned houses, as well as a farm, school, chapel and a Workmen's Institute. WHY? At St Fagans traditional crafts and activities help bring the past back to life. Inside the museum’s workshops craftsmen demonstrate traditional skills and their produce are for sale if you want to take home some souvenirs. Native breeds of livestock can also be seen in the fields and farmyards, and demonstrations of farming tasks take place daily too. WHEN? The museum is open daily between 10am and 5pm. CONTACT: Phone 029 2057 3500. HOW LONG WILL THIS TAKE? Allow at least between 2 and 4 hours for your visit. With so many interesting buildings to see, you can spend the whole day at St Fagan’s and have lots left to see on your next visit. WHO WILL ENJOY IT? Anyone with an interest in Welsh history and culture will enjoy exploring the 100-acre area packed with re-erected historical buildings. A visit to the Rhyd-y-Car Ironworkers' Houses is almost like traveling through time as you see six homes, their contents and gardens change from 1805 to 1985. Other popular locations include St Teilo's Church built in stages between 1100 and 1520, as well as Kennixton Farmhouse dating from 1610. WHAT ABOUT THE KIDS? Children under 11 must be accompanied by an adult at all times. HOW TO GET THERE? 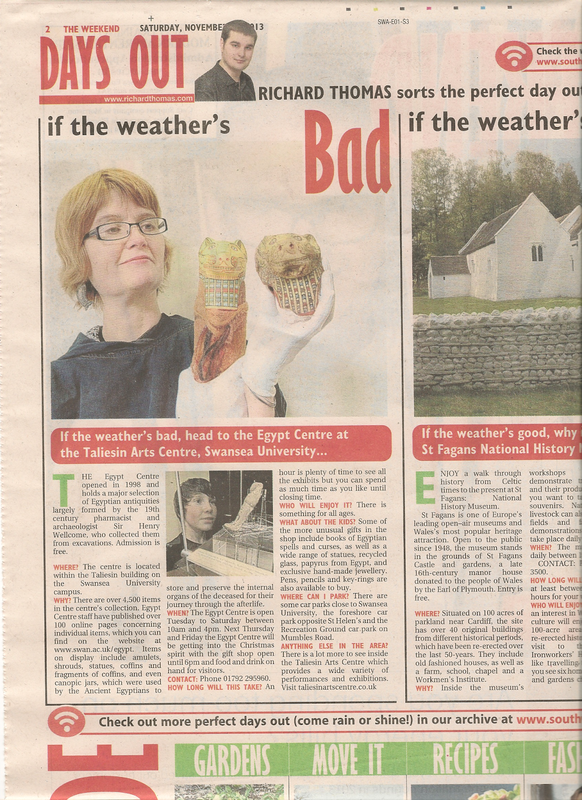 St Fagans: National History Museum is located 4 miles west of Cardiff City Centre, just off the A4232. For sat-nav users the full address and postcode is: St Fagans National History Museum Cardiff CF5 6XB. LUNCH: The assisted-service Vale Restaurant, situated on the first floor of the museum, serves hot and cold lunches; a range of sandwiches, baguettes & salads; home-made soup; cakes; and hot and cold drinks. The restaurant is family friendly and a range of children’s sandwich boxes and meals are also available. There is also the Gwalia Tea Rooms, a traditional 1930's tea room serving light lunches and afternoon teas, as well as the Cafe Bardi, situated in the Main Entrance Hall, which as well as hot and cold drinks, serves a variety of home-made cakes, sandwiches, boxed salads and soup. WHERE CAN I PARK? There is a car park on site, but this costs £3.50. ANYTHING ELSE IN THE AREA? Dominating Cardiff city centre is Cardiff Castle, a remarkable site with a history that spans over 2000 years to Roman times. Below is my “Days Out” column from The Weekend supplement in the Saturday, November 23, 2013, issue of the South Wales Evening Post. With an impressive 12 screens, the Vue Swansea can seat up to 1,762 people and is equipped with wall-to-wall screens and digital projectors, making it an ideal choice for viewing the best blockbusters in 3D! WHERE? The Vue Swansea is located in the center of Swansea. For sat-nav users the address and postcode is: Vue Cinema Swansea, York Street, Swansea SA1 3LZ. WHY? This weekend Doctor Who is celebrating fifty years of scaring children behind sofa with an explosive 50th anniversary episode. Shot in eye popping 3D, The Day of the Doctor will be broadcast in 76 countries simultaneously. And for the first time since the two Dalek films starring Peter Cushing in the 1960s, Whovians will have the chance to see the Time Lord’s greatest enemies on the big screen! Day of the Doctor stars Matt Smith as the Eleventh Doctor, David Tennant as the returning Tenth Doctor, and introduces John Hurt as the mysterious War Doctor. Billie Piper is also reprising her role as the Doctor’s companion Rose Tyler, alongside the newest TARDIS crew member Jenna Coleman as Clara Oswald. WHEN? 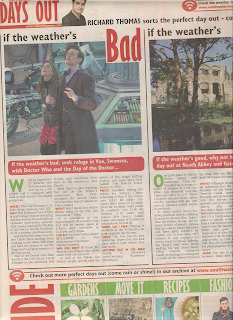 Day of the Doctor will be shown today (23 November) at the The Vue Swansea at 7.30pm. It is scheduled to run approximately 76minuets long and will be shown again at 9.30pm and tomorrow (24 November) at 12.45pm and 2.45pm. CONTACT? To book tickets phone 08712240240 or visitwww.myvue.com/home/cinema/swansea. WHO WILL ENJOY IT? Rated PG, there is something for fans of the series both old and new. As well as the Daleks, the feature length special sees the return of the shape shifting Zygons, not seen since they battled Tom Baker’s Fourth Doctor in 1975! PRICES? Standard seating 3D tickets for the Saturday 23 November 7.30pm screening of Day of the Doctor cost £10.15 for adults (19+ years); £8.00 for teens (13-18 years); £8.45 for students (valid photo ID required); and £7.60 for children (2-12 years) and seniors (60+ years). Family tickets (minimum of 2 children) are available for £30.40. LUNCH? The Vue has its own speed bar where you can kick back with a beer before your film starts. WHERE CAN I PARK? Parking is available in the St. David’s car park opposite the cinema. ANYTHING ELSE IN THE AREA? Nearby is Swansea’s award-winning Waterfront Winterland.With two ice rinks, a festive funfair, stalls, hot food and the Sky Ride, it’s fantastic fun for the festive season. Visit www.swanseachristmas.com. From spectacular natural scenery to stunning monument settings, the historical and archaeological landscapes of South Wales have lots to offer. One great place to visit is Neath Abbey and Gatehouse. Originally founded as a daughter house of Savigny in 1130, the abbey was absorbed into the Cistercian order in 1147. Fairly complete remains of the abbey survive, together with the 16th century mansion raised within its precincts. 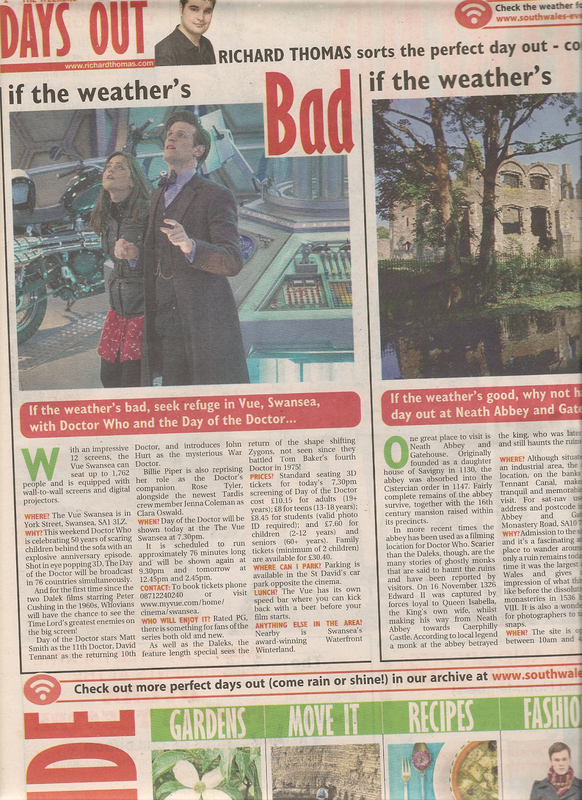 In more recent times the Abbey has been used as a filming location for Doctor Who. Scarier than the Daleks, though, are the many stories of ghostly monks that are said to haunt the ruins and have been reported by visitors. On 16 November 1326 Edward II was captured by forces loyal to Queen Isabella, the king's own wife, whilst making his way from Neath Abbey towards Caerphilly Castle. According to local legend a monk at the abbey betrayed the king, who was later killed, and still haunts the ruins today. WHERE? The abbey is located in Neath Port Talbot. Although situated near an industrial area, the Abbey's location, on the banks of the Tennant Canal, makes it a tranquil and memorable site to visit. For sat-nav users the address and postcode is: Neath Abbey and Gatehouse, Monastery Road, SA10 7DW. WHY? Admission to the site is free and it’s a fascinating and quiet place to wander around. While only a ruin remains today, at one time it was the largest abbey in Wales and gives a good impression of what things were like before the dissolution of the monasteries in 1536 by Henry VIII. It is also a wonderful spot for photographers to take some snaps. WHEN? The site is open daily between 10am and 4pm. Last admissions are 30-minutes before closing. CONTACT: For more information call 44 292 050 00200. HOW LONG WILL THIS TAKE? There is no charge to see the Abbey and Gatehouse, so you can spend as much time as you like taking in the surroundings. WHO WILL ENJOY IT? Whether you’re a fun seeking family or a couple looking for a romantic setting for a picnic, all ages will enjoy this beautiful historical site. LUNCH? The Abbey is a great place for a picnic, so pack one. ANYTHING ELSE IN THE AREA? Located in Port Talbot, along the eastern rim of Swansea Bay, Margam Country Park boasts a magnificent 18th century orangery, picturesque Tudor-Gothic style Victorian mansion house, a 12th century chapter house, ornamental gardens and one of the best deer herds in Wales. Children will enjoy the narrow gauge railway, adventure playground, farm trail and Fairytale Land. Visit www.margamcountrypark.co.uk. Below is my “Days Out” column from The Weekend supplement in the Saturday, November 14, 2013, issue of the South Wales Evening Post. This weekend Swansea’s award-winning Waterfront Winterland returns with all the magic of the festive season right in the heart of the city. Lighting up the skyline this year is the amazing Sky Ride along with some brand new festive funfair rides. Ice skating is still top of the bill with two fantastic outdoor ice rinks – the Admiral Rink and a children’s rink, plus Santa’s Grotto and an indoor café – all the ingredients for a perfect day out! For more information visit: www.swanseachristmas.com. WHERE? Waterfront Winterland is located in Museum Park, Swansea, just outside the LC and Swansea Museum. WHY? With two ice rinks, a festive funfair, stalls, hot food and the Sky Ride, it’s fantastic fun for the festive season. The Wave radio station has a studio at Waterfront Winterland, which you can listen to on 96.4FM. WHEN TO GO? Until January 5 Waterfront Winterland will be open every day except Christmas Day. CONTACT? Tickets for ice skating can be booked online (http://www.ticketsource.co.uk/info/waterfront_winterland.asp) or you can ring Swansea Tourist Information Centre on 01792 637300. Tickets and gift vouchers can also be bought in person from the Skate House at Waterfront Winterland or from the Tourist Information Centre on Plymouth Street, just opposite the bus station. HOW LONG WILL THIS TAKE? With so many great rides to try out at the funfair, plus the ice skating rinks, you’ll want to stay until closing. Waterfront Winterland is currently open 10am to 10pm on Saturday and Sunday, and 12pm to 10pm Monday to Friday. WHO WILL ENJOY IT? The whole family will enjoy the brand new Sky Ride replacing the Big Wheel this year. Visitors can also hover 60m above the ground in this spectacular chair ride and there is also a penguin children’s ride too. WHAT ABOUT THE KIDS? Kids will love the funfair where they can enjoy the Sky Ride, Carouse, Snow Storm, Fun House, Children’s rides, Simulator and Game Stalls. Funfair tokens cost £1.50 each, but some rides require more than 1 token to do. HOW DO I GET THERE? 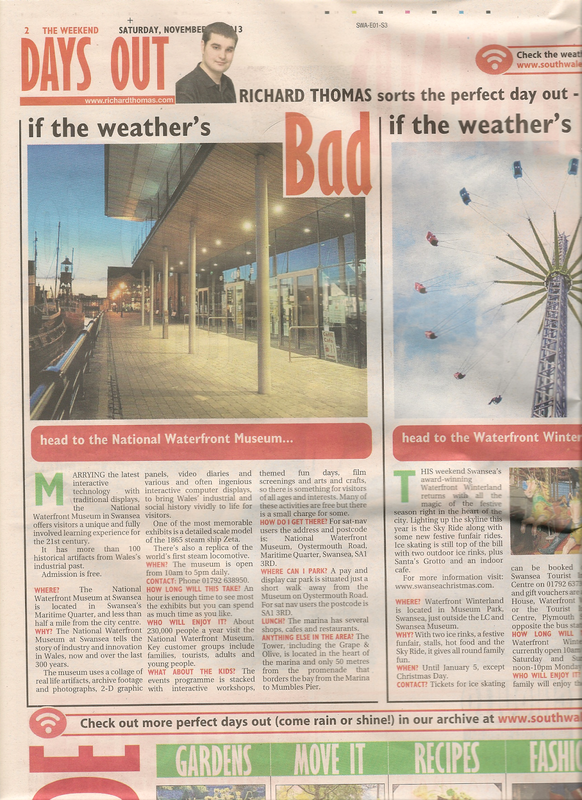 Waterfront Winterland takes place in the grounds of the National Waterfront Museum, which is right next to Swansea Museum and The LC. For sat-nav users the full address is: Waterfront Winterland, Museum Park, Oystermouth Road, Swansea, SA1 3RD. WHERE CAN I PARK? St David’s car park is a long-stay, pay-on-foot facility just 1 minute away from the Winter Wonderland site. LUNCH? There is an indoor café selling hot drinks and food to help stay warm. ANYTHING ELSE IN THE AREA? Nearby is the Quadrant shopping complex, where you can do some Christmas shopping. Jam-packed with the latest interactive technology married with traditional displays, the National Waterfront Museum in Swansea offers visitors a unique and fully involved learning experience for the 21st century. The museum has more than 100 historical artefacts from Wales’ industrial past. Formerly the site of the Swansea Industrial & Maritime Museum, the new National Waterfront Museum was opened in October 2005. The museum building itself is a synthesis of contemporary architecture and Welsh history. The building eloquently combining a Grade II listed former dockside warehouse built in 1902 with a 21st century glass and slate structure, designed exactly a century later by Stirling Prize-winning architects Wilkinson Eyre. Admission is free but you might want to purchase some keepsakes in the museum’s gift shop, where the money you spend is gifted back to the museum. Visitors wishing to take photographs will be required to complete a Declaration Form available from the Information Desk, but this doesn't take long, so bring a camera with you. To find out more about exhibits etc. you can visit the National Waterfront Museum website at www.museumwales.ac.uk/en/swansea. WHERE? The National Waterfront Museum at Swansea is located in Swansea's Maritime Quarter, and less than half a mile from the city centre. WHY? The National Waterfront Museum at Swansea tells the story of industry and innovation in Wales, now and over the last 300 years. The museum uses a collage of real life artefacts, archive footage and photographs, 2-D graphic panels, video diaries and various and often ingenious interactive computer displays, to bring Wales’ industrial and social history vividly to life for visitors. One of the most memorable exhibits is a detailed scale model of the 1865 steam ship Zeta, after which Swansea-born Hollywood actress Catherine Zeta Jones was named. There’s also a replica of the world's first steam locomotive, built by British inventor Richard Trevithick, which made its first journey along the tramway of the Penydarren Ironworks, near Merthyr Tydfil in 1804. WHEN? The museum is open from 10am to 5pm daily. HOW LONG WILL THIS TAKE? An hour is enough time to see most the exhibits but you can spend as much time as you like. WHO WILL ENJOY IT? 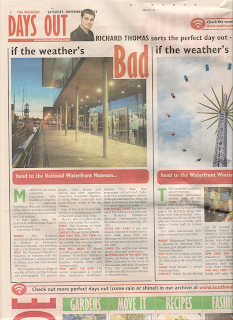 About 230,000 people a year visit the National Waterfront Museum. Key customer groups include families, tourists, adults and young people. WHAT ABOUT THE KIDS? The events programme is stacked with interactive workshops, themed fun days, film screenings and arts and crafts, so there is something for visitors of all ages and interests. Many of these activities are free but there is a small charge for some. HOW TO GET THERE? For sat-nav users the address and postcode is: National Waterfront Museum, Oystermouth Road, Maritime Quarter, Swansea, SA1 3RD. WHERE CAN I PARK? A pay and display car park is situated just a short walk away from the Museum on Oystermouth Road. For sat nav users the postcode is SA1 3RD. LUNCH? The Marina has several shops, cafes and restaurants. The Grape and Olive can be found on the 28th floor of the Meridian Tower by Swansea Marina. For sat nav users the postcode is SA1 1JW. Go to www.grapeandolive.co.uk or phone 01792 462617. ANYTHING ELSE IN THE AREA? The Tower is located in the heart of the Marina and only 50 metres from the promenade that borders the bay from the Marina to Mumbles Pier. 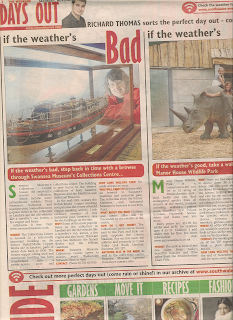 Below is my “Days Out” column from The Weekend supplement in the Saturday, November 9, 2013, issue of the South Wales Evening Post. The National Botanic Garden of Wales is the most visited garden in Wales. The site offers a stunning range of themed gardens that appeal to a wide range of visitors, from those who just love the sight and smells of flowers to those who want to know about medicinal plants or the latest DNA research into plant evolution. Admission prices are: £8.50 for adults, £7 for OAPS, and £4.50 for children 5 to 16 years old. Children 5 years and younger visit for free and families (2 adults and up to 4 children) can enter for £21. For more information visit: www.gardenofwales.org.uk. WHERE? Spread across 560 acres of beautiful countryside, The National Botanic Garden of Wales is situated near Llanarthney in the Towy Valley, Carmarthenshire. WHY? The garden is both a visitor attraction and a centre for botanical research and conservation, and features the world's largest single-span glasshouse measuring 110 metres long by 60 metres wide. WHEN TO GO? They are open daily between 10am and 4.30pm. CONTACT? Phone the switch board on 01558 668768 or send an email to info@gardenofwales.org.uk. HOW LONG WILL THIS TAKE? With an amazing collection of over 8000 different plant varieties and lots more to see, you’ll want to set aside the whole day to see everything the gardens have to offer. WHO WILL ENJOY IT? There is something for all ages to enjoy inside the garden. Families will enjoy the fantastic Magical Mystery Tour, a fun trail of the weird and wonderful aspects of the garden. Along the way you can visit the Great Glasshouse and see the amazing glowing fungus, see the Plastic Bottle Greenhouse, and hear the mystical story of the Lady of The Lake. WHAT ABOUT THE KIDS? There is plenty of open space inside the garden for kids to run around and play in, but they will love the Roots and Shoots Adventure Zone, a willow play area with slides, climbing frames, tunnels and musical blocks made entirely of recycled materials. Not only is this great fun but it is educational too, as children also get to learn about plants at the same time. The “seed” and “seedling” zones were designed for younger visitors, while the “Leaf Lookout”, “Root Run”, “Branch Balance” and “Flower Fort” provide a bigger challenge for older children. HOW DO I GET THERE? The National Botanic Garden of Wales is situated 10 minutes from the M4 and ¼ mile from the A48 in Carmarthenshire, midway between Cross Hands and Carmarthen. For sat-nav users the full address and postcode is: National Botanic Garden of Wales, Llanarthne, Carmarthenshire, SA32 8HN. WHERE CAN I PARK? The garden has an onsite car park. LUNCH? 90% of all the food served in the garden’s catering outlets is prepared and cooked on site by their excellent in-house catering team. The best place to visit to eat is the Seasons Restaurant, located in our Stable Block. Also serving locally made and sourced light food and drinks is the Gatehouse Café, which can be found at the garden’s entrance. The café is a lovely place to sit and relax, and locally produced produce, such as jams, cheeses and cakes, are all available to buy to take home with you. ANYTHING ELSE IN THE AREA? Pembrey Country Park is one of Wales’ top visitor attractions providing a unique blend of coast and countryside. Consisting of some 500 acres of parkland, you can enjoy a picnic then check out the ski slope, Cobra toboggan ride, steam railway and many other facilities inside the park. Fans of Arnold Schwarzenegger's favourite alter ego the T101 will recall the high-tech laser battle fought between humans and machines at the beginning of T2: Judgment Day. At Laserzone you can get a taste of what it would have been like to be on the set of James Cameron’s classic film, while you and your team take part in your own futuristic warfare. Visit www.laserzone.org. WHERE? Lazerzone is located opposite Castle Square next to Swansea Castle. WHY? 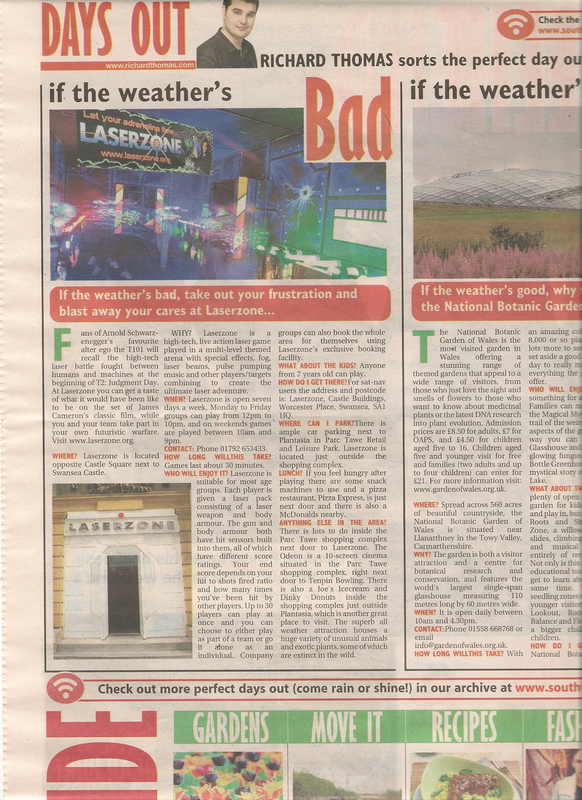 Laserzone is a high-tech, live action laser game played in a multi-level themed arena with special effects, fog, laser beams, pulse pumping music and other players/targets combining to create the ultimate laser adventure. WHEN? Laserzone is open seven days a week. Monday to Friday groups can play from 12pm to 10pm, and on weekends games are played between 10am and 9pm. HOW LONG WILL THIS TAKE? Games last about 30 minutes. WHO WILL ENJOY IT? Lazerzone is suitable for most age groups. Each player is given a laser pack consisting of a laser weapon and body armour. The gun and body armour both have hit sensors built into them, all of which have different score ratings. Your end score depends on your hit to shots fired ratio and how many times you’ve been hit by other players. Up to 30 players can play at once and you can choose to either play as part of a team or go it alone as an individual. Company groups can also book the whole area for themselves using Lazerzone’s exclusive booking facility. WHAT ABOUT THE KIDS? Anyone from 7 years old and up can play. HOW DO I GET THERE? For sat-nav users the address and postcode is: Laserzone, Castle Buildings, Worcester Place, Swansea, SA1 1JQ. WHERE CAN I PARK? There is ample car parking next to Plantasia in Parc Tawe Retail and Leisure Park. Lazerzone is located just outside the shopping complex. LUNCH? If you feel hungry after playing there are some snack machines to use and a pizza restaurant, Pizza Express, is just next door and there is also a McDonalds nearby. ANYTHING ELSE IN THE AREA? There is lots to do inside the Park Tawe shopping complex next door to Lazerzone. The Odeon is a 10 screen cinema situated in the Park Tawe shopping complex, right next door to Tenpin Bowling. There is also a Joes Icecream and Dinky Donuts inside the shopping complex just outside Plantasia, which is another great place to visit. 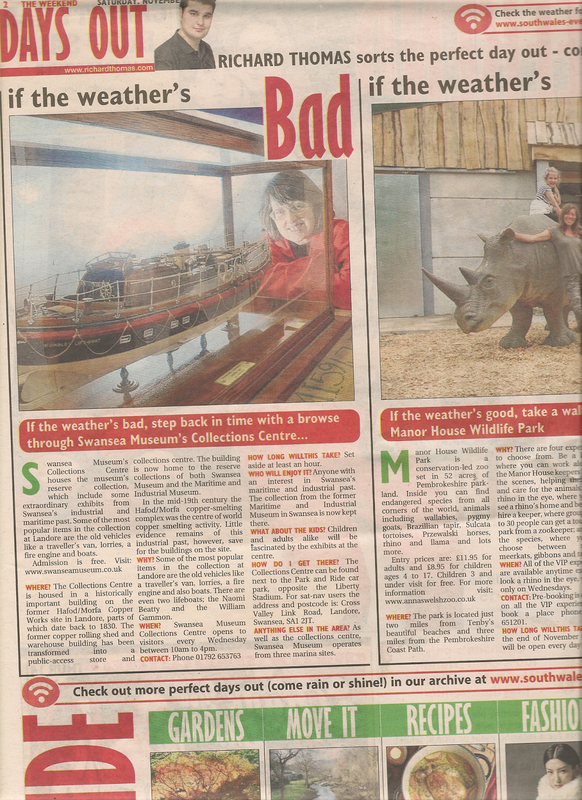 The superb all weather attraction houses a huge variety of unusual animals and exotic plants, some of which are extinct in the wild. Below is my “Days Out” column from The Weekend supplement in the Saturday, November 2, 2013, issue of the South Wales Evening Post. Manor House Wildlife Park is a conservation-led zoo set in 52 acres of Pembrokeshire Parkland. Inside you can find endangered species from all corners of the world in a natural and beautiful corner of Wales. Animals at the park include Wallabies, Pygmy goats, Brazillian tapir, Sulcata tortoises, Przewalski horses, Rhino, Llama and lots more. Entry prices are: £11.95 for adults and £8.95 for children ages 4 to 17. Children 3 and under visit for free. For more information visit: www.annaswelshzoo.co.uk. WHERE? The park is located just 2 miles from Tenby’s beautiful beaches and 3 miles from the Pembrokeshire Coast Path. WHY? Setting the park apart from others are the special VIP experiences, where visitors can come face-to-face with rare species in their natural surroundings with professional zoo-keepers who know them well. There are 4 experiences to choose from. Be a Keeper, where you can work alongside the Manor House keepers behind the scenes, helping them feed and care for the animals; Look a Rhino in the Eye, where you can see a rhino’s home and bedroom; Hire a Keeper, where groups of up to 30 people can get a tour of the park from a zookeeper; and last but not least, Meet the Species, where you can choose between meeting Meekats, Gibbons and Tapirs. WHEN TO GO? All of the VIP experiences are available anytime except for Look a Rhino in the eye, which is only available on Wednesdays. CONTACT? Pre-booking is essential on all the VIP experiences. To book a place phone: 01646 651201. HOW LONG WILL THIS TAKE? Until the end of November the park will be open every day between 10am and 5pm. With so many different rare species to see, you’ll want to spend the whole day at the park. WHO WILL ENJOY IT? Children especially will enjoy seeing the animals in their natural habitat, but the park’s Wild Welsh Zoo has something for everyone. WHAT ABOUT THE KIDS? Kids will enjoy the wildlife trail and can also have fun in the secure indoor Hay Play area. HOW DO I GET THERE? Manor House Wildlife Park is on the B4318 Sageston to Tenby Road, at the edge of the floral village of St Florence, just two miles from Tenby. For sat-nav users the address and postcode is: Manor House Wildlife Park, St Florence, Tenby, Pembrokeshire, SA70 8RJ. WHERE CAN I PARK? There is a free parking available. LUNCH? With its network of intimate tree-shaded walkways and wide open spaces the park is perfect for picnics on a warm day. There is also the Snack Shack and Real-Food Café. ANYTHING ELSE IN THE AREA? Nearby is Heatherton World of Activities. Open all year round this family leisure park has a wide range of indoor and outdoor activities, with something for the whole family to enjoy. Admission to the park is free as visitors only pay for what they want to do. Visit www.heatherton.co.uk. Swansea Museum’s Collections Centre is a fascinating place to visit because it houses the museum's reserve collection, which include some extraordinary exhibits from Swansea’s industrial and maritime past. Some of the most popular items in the collection at Landore are the old vehicles like a traveller's van, lorries, a fire engine and also boats. WHERE? The Collections Centre is housed in a historically important building on the former Hafod/Morfa Copper Works site in Landore, parts of which date back to 1830. The former copper rolling shed and warehouse building has been transformed into a public-access store and collections centre. The building is now home to the reserve collections of both Swansea Museum and the Maritime and Industrial Museum, providing more opportunities for the public to see some wonderful gems from history. In the mid-19th century the Hafod/Morfa copper-smelting complex was the centre of world copper smelting activity. Little evidence remains of this industrial past, however, save for the buildings on the site. WHY? Some of the most popular items in the collection at Landore are the old vehicles like a traveller's van, lorries, a fire engine and also boats. There are even two lifeboats; the Naomi Beatty and the William Gammon. The later was gifted to the museum in 1992 and was named in memory of the coxswain of the Mumbles lifeboat, who lost his life along with the other seven crew members on April 23rd, 1947 whilst attempting to rescue the crew of the Samtampa. WHEN TO GO? Swansea Museum Collections Centre opens to visitors every Wednesday between 10am to 4pm. HOW LONG WILL THIS TAKE? Set aside at least an hour. WHO WILL ENJOY IT? Anyone with an interest in Swansea’s maritime & industrial will enjoy a visit to the centre. The collection from the former Maritime & Industrial Museum in Swansea is now kept there. WHAT ABOUT THE KIDS? Children and adults alike will be fascinated by the exhibits at the centre. HOW DO I GET THERE? The Collections Centre can be found next to the Park and Ride car park, opposite the Liberty Stadium. For sat-nav users the address and postcode is: Cross Valley Link Road, Landore, Swansea, SA1 2JT. ANYTHING ELSE IN THE AREA? As well as the collections centre Swansea Museum operates from another 3 sites: the museum’s main building on Oystermouth Road, Swansea, which has 6 galleries containing all kinds of unusual objects from ancient Egypt to the Victorian era; the museum's 3 floating exhibits kept at the Marina; and The Tramshed on Dylan Thomas Square, also at the Marina, which displays memorabilia from the old street trams of Swansea.